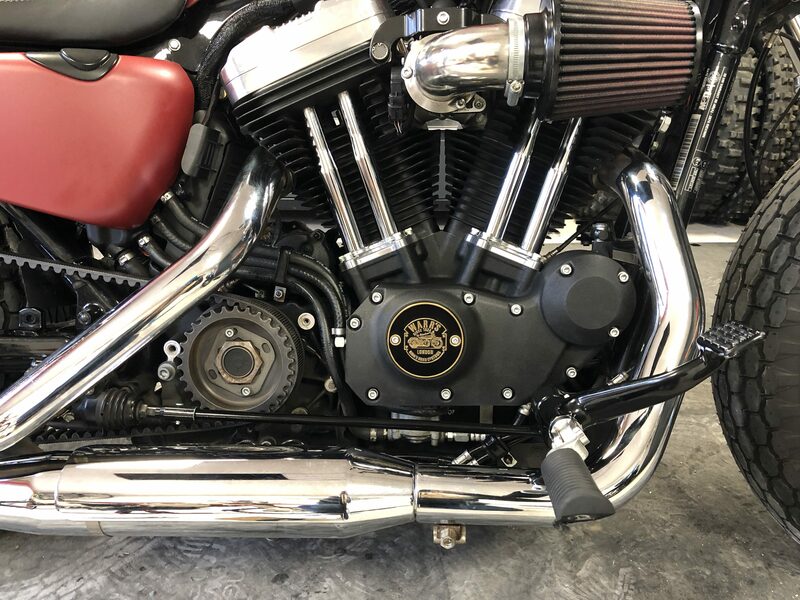 Please click around to enjoy this interactive image to learn about the products I'm currently using on my Harley-Davidson Forty-Eight Sportster. Big, bold retro tires by Coker Tire Co. I picked them to give the ride a different look while also improving the ride quality. The big chunky volume of rubber definitely improve the look and ride. I picked them up from North Hants Tyres. Improving the air flow from stock with a K&N air intake. The right angle pipe is home made to give a rugged look. I'm a lover of my beanies with my favourites being by OzDynes and For The Shore. Lucky owner of a Warr's London timer cover from Charlie Stockwell. Great little home custom job creating a cut back rugged look. Please see my article how to for more details. See how it's done in my Cam case chop customisation article. Rake Trail 30° / 4.2 in.